^ a b c d e f g h Auchmuty, J. J. (1966). 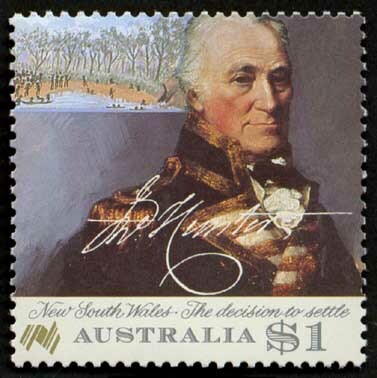 "Hunter, John (1737–1821)". Australian Dictionary of Biography (in English). 1. Canberra: Australian National University. Retrieved 2013年4月9日. ^ a b c Serle, Percival (1949). "Hunter, John". Dictionary of Australian Biography (in English). Sydney: Angus & Robertson. Retrieved 12 August 2009. ^ a b c d e f Laughton, J.K. (1891). "Hunter, John (1738-1821)" . In Lee, Sidney. Dictionary of National Biography (in English). 28. London: Smith, Elder & Co. p. 294. ^ a b c d e f Laughton, J.K. (1891). "Hunter, John (1738-1821)" . In Lee, Sidney. Dictionary of National Biography (in English). 28. London: Smith, Elder & Co. p. 295. ^ Brian K. Hall (1999-03). “The Paradoxical Platypus”. BioScience (American Institute of Biological Sciences) 49 (3): 211–218. doi:10.2307/1313511. JSTOR 1313511.